We print below, in edited form, a presentation by Paul Collins of the Spartacist League at a September 27 New York City forum. I noticed in reading Sundays New York Times that it looks like Hillary Clinton is running away with the Democratic Party nomination. We are Trotskyists—revolutionary communists—so we dont really care that much. Who can stomach Bush? But as we keep telling the Anybody but Bush crowd, supporting the capitalist Democratic Party and building a vote for Clinton means building support for a party whose candidate will be anti-working-class, anti-communist and will possibly get us all killed in a thermonuclear war. We tell them: labor must break with the Democrats. We need to build a workers party to fight for a workers government. I remember back in December 2005 that Senator Clinton and then New York State attorney general—and now governor—Eliot Spitzer condemned the just and powerful, though too brief, Transport Workers Union Local 100 strike by New York City transit workers. They relished bringing down the Taylor Law on the strikers. Hillary Clinton, Eliot Spitzer, the Democrats—these are enemies of the working people. I looked up Clintons position on China, since China is the topic of the forum. And she is very consistent. She is part of a strident anti-China cabal in the U.S. Senate. She says China is eroding U.S. economic sovereignty, holds too much U.S. debt—China apparently now holds about $407 billion in U.S. Treasury bonds. This has been helping to keep the U.S. economy afloat, and now the dollar is going down. She condemns China for manipulating its currency and demands the rule of law, which is an imperialist code word for: we have to have a capitalist counterrevolution in that country and get things squared away. She also condemns China on human rights and yearns to be the imperialist Commander-in-Chief who presides over capitalist counterrevolution in China. The Democratic Party is the enemy of working people here, and of 1.3 billion people in the Peoples Republic of China (PRC). China is not a capitalist country. The economy is primarily based on collectivized property, not on capitalist private property and production for profit based on the exploitation of labor. It is the most populous country on earth, with an economic growth rate that has been outstripping that of any capitalist country for years. It has an industrial sector that has created the largest and one of the most militant proletariats in the world, an industrial sector sufficiently developed to build a nuclear deterrent to the imperialist mass murderers in Washington, London, Berlin and Tokyo and to put a man in space. The Peoples Republic of China is ruled by a nationalist, bureaucratic Stalinist caste. It is a caste that fears and hates the working class but whose rule derives from the existence of collectivized property forms. We characterize China as a deformed workers state. And we draw certain programmatic conclusions from that. We are for the unconditional military defense of China against imperialism and internal counterrevolution. We are for proletarian political revolution to oust the ruling Chinese Communist Party (CCP) bureaucracy and install the rule of workers and peasants soviets. We are for the extension of the gains of the 1949 Chinese Revolution to the rest of Asia, in particular to Japan, the industrial powerhouse of Asia, and beyond to the rest of the world. We are for forging the revolutionary working-class internationalist party to lead that world revolution. To understand China today, you have to begin with 1949 and the revolution that transformed China, which made possible the huge industrial and social leap. The state in China under Mao Zedong was the dictatorship of the proletariat, a workers state, but despite its great gains, it was deformed from birth. The 1949 Revolution occurred under exceptional historical circumstances. An essential ingredient in the birth of the Chinese deformed workers state was the existence of the Soviet Union, a workers state that provided military and economic support to the young Peoples Republic. In a civil war after the end of World War II, the thoroughly corrupt capitalist Guomindang regime of Chiang Kai-shek collapsed and was smashed by the Peoples Liberation Army (PLA). The motor force of the revolution was a peasant uprising, and the CCP, which stood at the head of it, was a peasant party. In China, historical development had intermeshed the landlord and the capitalist class to an unusual extent, so the impact of the peasant insurrection was felt in the cities by the urban bourgeoisie with great force. The proletariat was not a factor in the Third Chinese Revolution in 1949. It had been smashed and atomized in 1927 with the bloody defeat of the Second Chinese Revolution by the Guomindang and then subjected to fierce repression under the Japanese occupation. In fact, the Maoist PLA tried to make certain that the working class was not a factor in 1949. As the CCP was driving out Chiang, it responded to workers uprisings, of which there were a few in Shanghai and other cities, by putting a ban on strikes, instituting compulsory arbitration, slashing wages and lengthening the working day. Maos CCP had called for forming a democratic coalition government with the nationalist bourgeoisie. But the Chinese bourgeoisie fled to Taiwan, under the protection of U.S. imperialism. Formerly divided and horribly exploited by imperialism, mainland China was unified. Land was distributed to the peasants and later collectivized. Women, who had been basically chattel for a thousand years (historically symbolized by the barbaric practice of footbinding), advanced by many orders of magnitude beyond that oppression. Although it was a workers state, the state that issued out of the 1949 Revolution was governed by an anti-working-class, privileged, petty-bourgeois, nationalist bureaucracy. The CCP regime was based on the reactionary Stalinist dogma of building socialism—i.e., a classless society of material abundance—in one country. China ended up with collectivized property forms without workers democracy. We call for workers political revolution to oust that bureaucracy and replace it with the rule of soviets dedicated to defending and extending the collectivized property forms, the gains of the revolution. The PRC was modeled on the Soviet degenerated workers state. But the Soviet Union in 1949 was not the Soviet workers state of 1917 to 1924. The Bolshevik Revolution of October 1917 established the dictatorship of the proletariat and took Russia out of World War I, which had savaged the people and resources of the country. The new regime then had to fight a three-year civil war, which it won, during which the country was invaded by 14 capitalist powers. The Civil War further depleted the country and, importantly, decimated the ranks of the class-conscious proletariat. With the defeat of the 1923 German Revolution, the tide of revolution in Europe that had emerged at the end of WWI ebbed. Young Soviet Russia faced the world alone and hungry. A conservative mood gripped the country. There was a political counterrevolution led by a bureaucratic caste, which began its consolidation of political power to the exclusion of the working class in 1923-24. We say that what took place was a political counterrevolution because the collectivized property forms remained intact but the working class was politically expropriated. The Stalinist regime introduced the theory of building socialism in one country, which had no currency among the Bolsheviks before that time. The defeat of the Second Chinese Revolution occurred in great measure due to the policy of Stalins Communist International, which subordinated the CCP to the bourgeois Guomindang. But despite the bureaucratic degeneration, the USSR remained a workers state. The Soviet nuclear shield saved China, Vietnam, North Korea and Cuba, which are also deformed workers states, from nuclear incineration by the imperialists. Even in isolation and despite bureaucratic mismanagement, the Soviet Union was transformed from a backward, overwhelmingly peasant society into a modern industrial power, showing sharp economic growth even as the capitalist world reeled under the chaos of the 1930s Great Depression, stagnating and sinking. This shows the overwhelming superiority of the collectivized property forms and planned economy over capitalism. This validates the superiority of the dictatorship of the proletariat over the rule of the bourgeoisie. The Soviet Union provided an economic and military counterweight to imperialism. But imperialist encirclement, combined with the rule of a narrow, nationalist bureaucratic caste, eventually led to the social counterrevolution in 1991-1992, which destroyed the homeland of the October Revolution (see Spartacist pamphlet How the Soviet Workers State Was Strangled). Maoists and neo-Maoists outside China believe that China is capitalist and has been for some time. Neo-Maoists within China want to reform the bureaucracy by changing its policies. They are opposed to the market socialist economy, though they believe that China is still socialist. The Chinese New Left is heterogeneous. Most support the market economy, but they are critical of the ramifications of the market: corruption, the growing gap between rich and poor and so forth. Some, like Wang Hui, a prominent spokesman of the New Left, say that after the suppression of the Tiananmen protests in 1989, China has completely conformed to the dictates of capital and the activities of the market. Thats a long way of saying that it has gone capitalist. We Trotskyists sharply disagree with all these views. And if you are talking with Chinese students on a college campus now, you might well get two different views of the question. One answer would be to look back fondly to the period of Maoist egalitarian rhetoric. These students would likely claim that the market reforms are a total betrayal of the Chinese Revolution. The second answer, which is much more widely held, is that the market reforms are overwhelmingly good. Both these views capture only part of the reality, however, and are fundamentally false. Under Mao, China was able to build a substantial industrial base. But without massive aid from socialist revolution in one or more imperialist countries, there could be nowhere near a sufficient industrial development to revolutionize the countryside. China at the time of Maos death remained a largely rural, peasant country. Agriculture remained backward. Agricultural output could not keep pace with industrial growth, and low agricultural productivity in turn became a barrier to increased industrialization. Mao promoted a policy of nationalist autarky—or self-reliance—which is a profoundly unreal conception that China could achieve socialism purely through its own methods in an economically backward and resource-poor country. The results of the command economy under Mao were inefficiency, poor productivity, poor quality and scarcity. Deng Xiaoping, who came to power in 1978, asserted his market reforms—the reintroduction of elements of the capitalist market economy into China, which he, like a good nationalist, called building socialism with Chinese characteristics. These measures were an attempt by a Stalinist bureaucracy viscerally hostile to proletarian democracy, which is necessary for the healthy operation of a planned economy, to use the whip of the marketplace to correct the inefficiencies of the command-planned economy. Over time, the regime abolished what was known as the iron rice bowl, which was based on lifetime job security. It opened the country to imperialist investment and eventually relinquished the state monopoly of foreign trade. The planned economy was supplanted by market mechanisms, and agriculture was decollectivized, with peasant families getting their own small plots on the basis of long-term leases. The market reforms did result in growth. Thats indisputable. The proportion of the population living in cities has doubled. There has been a vast increase in industrial capacity, and over half the workforce works in manufacturing, transport, construction and the service sector. Up to 150 million peasants during this period became proletarians, which is a step of great historic progress and importance. By every economic measure, development in China has greatly outstripped growth in the capitalist neocolonies, for example, the former tiger economies like Indonesia and South Korea. It is useful to compare Chinas growth to that of capitalist India, the imperialists favorite emerging giant in Asia. India has a gross domestic product per capita that is barely half that of China. Chinas poverty rate is half that of Indias. The rate of malnutrition of children is three-quarters less. Female adult literacy in China is nearly 90 percent, almost double that in India. Although we are quite aware of the danger posed by imperialist economic penetration, we fight against the notion that the market reforms mean that China has gone capitalist. In fact, the core of the economy remains collectivized. The private sector, including foreign companies, is made up mostly of light industry. Heavy industry—steel, nonferrous metals, heavy machinery, telecommunications, electric power, oil extraction and refining—is concentrated in state enterprises, and these are strategically far more important. The nationalization of the land has prevented the development of a stratum of wealthy large landowners dominating the countryside. And the states control of the financial system has to date shielded the PRC from the disastrous effects of the rapid movement of speculative money capital, which has played havoc with so many neocolonial countries. But Chinas recent development, this progress, is contradictory, and it has a downside that undermines the strength of the workers state. In China, the contradiction between bourgeois norms of distribution (i.e., inequality) and collectivized property is not mitigated through careful planning, education, training and the industrialization of agriculture, as it would be in a healthy workers state under a Bolshevik leadership. To gain the necessary level of productivity, the revolution would have to be internationalized, a perspective that the Stalinist bureaucracy opposes. The market reforms have created a wealthy new class of capitalists with links to the CCP officialdom and the offshore Chinese bourgeoisie in Taiwan, Hong Kong and elsewhere. The children of some top CCP officials have become wealthy capitalists in their own right. At the same time, the CCPs market measures have impoverished millions of workers, hollowed out crucial social gains like health care and created tens of millions of unemployed. Workers forced to find new jobs in the private sector generally work for lower wages, with none of the benefits provided by the state enterprises. And 150 million migrant workers have moved to the cities, where they labor under terrible conditions with few political rights and are looked down on by workers with urban residence permits. Trotsky makes the point in The Revolution Betrayed, his 1936 analysis of the degeneration of the Soviet workers state, that the bureaucracy defends the collectivized property forms only to the extent that it fears the working class. And you can see that in China today. The regime of Hu Jintao and Wen Jiabao is working on a program called the harmonious society, which will be showcased harmoniously at this years CCP National Congress. Of Chinas 31 provinces, 29 increased their minimum wage last year. The Ministry of Labor and Social Security recently instructed local governments to raise minimum wages because inflation was 3.4 percent in May alone. This is not exactly the way a capitalist government works. An article in The Australian (16 July) notes that the All China Federation of Trade Unions, which is very much the creature of the bureaucracy, has been gaining recognition from many of the major foreign investors in China, most famously Wal-Mart, which has never before recognized unions anywhere it has operated! There is tremendous social tinder for a proletarian political revolution. But to carry that out, the Chinese working class needs a revolutionary internationalist leadership. I said that we are for the unconditional military defense of China. What does that mean? It means that we defend China militarily without placing any conditions on the bureaucracy or demanding its prior overthrow. But at the same time we give no political support to the Stalinist regime. The anti-revolutionary nature of the Chinese Stalinist bureaucracy is shown by its policy toward U.S. imperialism, which is one of the ways that it has most weakened the deformed workers state. In 1972, when the U.S. was raining bombs down on Vietnam, Mao sealed his anti-Soviet alliance with U.S. imperialism, which was a logical outcome of the bureaucracys working for peaceful coexistence with Washington. Maos policy was extended under the regime of Deng Xiaoping, who in 1979 invaded Vietnam, acting as a cats paw for U.S. imperialism. The Chinese, by the way, were soundly beaten by the seasoned Vietnamese troops. In the 1980s, Dengs regime supported the Afghan mujahedin against the Soviet Red Army. In many ways, the Beijing bureaucracy directly aided U.S. imperialism in the destruction of the Soviet Union. And the alliance with U.S. imperialism helped prepare the economic penetration of China. Today Hu Jintao carries on this traitorous tradition in supporting the global war on terror, under which banner the U.S. imperialists occupy Iraq and Afghanistan and threaten Iran, one of Chinas main oil suppliers. And Beijing has helped orchestrate the six-party talks aimed at disarming North Korea, even supporting a United Nations resolution in October 2006 imposing sanctions on North Korea. As was already starkly shown in the Korean War, any weakening of North Korea in the face of imperialist militarism also weakens the military defense of China. It is clear that North Korea needs nuclear arms, and we are all for that. In a world dominated by the U.S. imperialist madmen, one guarantee of national sovereignty is the possession of nuclear weapons. Another important question is Taiwan, which since 1949 has been an outpost for U.S. imperialisms counterrevolutionary schemes, military threats and interference in Chinese internal affairs. We oppose those who clamor for Taiwans supposed right to independence. Taiwan has been since ancient times a part of China, and we Trotskyists will stand with China in the event of any military conflict with capitalist Taiwan or with imperialism. We are opposed to the Stalinists plan of reunification with Taiwan embodied in the one country, two systems slogan. Instead, we advance a program for the revolutionary reunification of China, which requires a workers political revolution on the mainland and a proletarian socialist revolution in Taiwan to overthrow and expropriate the bourgeoisie. We also call for the expropriation of the Hong Kong capitalists. The U.S.-Japan imperialist rivalry at this point is subordinate to their anti-China/North Korea alliance. Over the past decade, the Pentagon has strengthened its military deployment in the Pacific Rim region. With its incursion into Afghanistan and Central Asia, the U.S. has significantly strengthened its military vise around China. Japans Self-Defense Force—i.e., its military—is now rebuilding to the tune of about $40 billion a year. The Pentagon is developing new weapons to enhance its ability to neutralize the PRCs small nuclear arsenal. Defense of China against imperialist military threats necessarily includes support to the PRCs possession and development of nuclear weaponry. By its appeasement of imperialism and its suppression of the Chinese working class, the Stalinist bureaucracy shows itself to be an obstacle to the defense of the Chinese Revolution and to the necessary international workers revolution. With Chinas huge population and its pivotal position in the world economy, a proletarian political revolution there would truly shake the world. It would restore revolutionary Marxism to its rightful place in the eyes of the world proletariat. It would spur revolutionary reunification of Korea through political revolution in the North and social revolution in the South. It would spark revolutionary upsurges in the ASEAN countries of Southeast Asia. It would shine a revolutionary beacon to the proletariat of Japan and reverberate internationally, including right here in the heartland of American imperialism. The social tinder in China is accumulating, and when it blows, the regime will shatter, posing either capitalist counterrevolution or proletarian political revolution. The potential for the latter was shown in the May-June events of 1989 in Tiananmen Square in Beijing. Student demonstrations against bureaucratic corruption and for political liberalization were soon joined by masses of workers protesting high inflation and raising other grievances. They began to hold mass meetings and to form workers assemblies that had the potential to become workers councils. Workers protests occurred in cities around China. June 1989 illustrated a crucially important point about the army in a workers state in contrast to the capitalist military—i.e., that it can be split vertically during a workers political revolution, with sections of both the rank and file and the officer corps making common cause with the insurgent workers. Initially, army units sent in failed to suppress the demonstrations because they solidarized with the students and workers demands and fraternized with protesters. The Tiananmen events terrified the bureaucracy, some of whose elements sided with the students. For two weeks the regime could not implement its martial law decree. Ultimately, however, it responded with savage repression. The massacres of June 1989 overwhelmingly targeted the workers and could only be carried out when the regime brought in army units considered more loyal. The International Communist League intervened from afar with our press, calling to Oust the Bureaucrats—For Lenins Communism! Workers and Soldiers Soviets Must Rule! (WV No. 478, 26 May 1989). After the massacre, Workers Vanguard headlined: Defend Chinese Workers! Stop the Executions! (WV No. 480, 23 June 1989). While we were not able to intervene in China directly, six months later we had the opportunity to intervene in another workers upsurge that posed a proletarian political revolution in a deformed workers state: the German Democratic Republic (DDR). When the East German population rose up against the Stalinist bureaucracy and its privileges and mismanagement, the regime began to disintegrate. Up to a million people rallied in protests, raising slogans like For Communist Ideals—No Privileges! We undertook the biggest intervention in the history of our tendency, fighting for workers and soldiers councils to be forged and to take power. We called for the revolutionary reunification of Germany—for a red Germany of workers councils in a Socialist United States of Europe! Two programs were competing: the Trotskyist program of defending and extending the gains of the workers state and the Stalinist program of capitulation and counterrevolution. The Treptow demonstration frightened the powers that be, and the forces of counterrevolution went on to overwhelm the situation. The Soviet Stalinist regime quickly surrendered the DDR to capitalism. But the lessons of this struggle must be assimilated by the international working class, including and most especially in China. Our intervention showed how, when an accumulation of events finally produces an upheaval and a crack in bureaucratic rule, it is possible for a revolutionary internationalist program to have a massive impact. I now want to talk a little bit about the anti-Communist China-bashing thats going on and the stance toward China taken by the labor bureaucrats here in the belly of the imperialist beast, as well as the reformist left groups that tail them. The bottom line is this: the labor tops and fake socialists stand with the imperialists. In supporting all manner of anti-Communist campaigns against China, they are reprising their dirty work in backing the capitalist counterrevolution that destroyed the Soviet Union. I want to start with the question of protectionism. Everybody in this room knows that the capitalists have been looting the working class of this country. In the last two decades, the wealth amassed by the banks and corporations has soared while workers and the poor have seen huge cuts in real wages and social services. Hundreds of thousands of industrial jobs are gone, especially in the Midwest. Despite some outbursts of labor struggle, the union leaders have repeatedly capitulated to the capitalists giveback demands. Instead of using class-struggle weapons like strikes, they whip up America first nationalist protectionism, claiming that workers abroad are stealing jobs. At the same time, the same labor bureaucracy pours millions from the union treasuries into the coffers of the Democratic Party. One example of this is the United Steelworkers union misleaders, who regularly demand that the U.S. act against Chinese steel imports. Then theres the UNITE HERE hotel, restaurant and garment workers union tops, who have a long history of collaborating with the textile bosses in trying to pressure the government to limit imports from China. Protectionism underlines the pro-capitalist character of the labor bureaucracy—a thin, privileged layer at the head of the unions. Its calls to ally with the U.S. capitalist state against foreign competition are flatly against the workers interests, which lie in common, internationalist class struggle against capitalism. Protectionist calls are coupled with demands that the U.S. rulers take a stand against China on the issue of human rights. And youre going to see a lot more of this as we get closer to the 2008 Olympics. To look to the U.S. capitalists as a progressive force for human rights anywhere is absolutely grotesque. This is the same ruling class that has murdered millions in wars throughout the world, from Korea to Vietnam to Iraq, that has visited unspeakable devastation on the American Indian population and rules a country whose very foundation is based on the legacy of human slavery and the racist oppression of black people. The AFL-CIO bureaucracy was forged through vicious purges of reds from the unions from the l940s up into the 1960s. In the 1980s, the AFL-CIO tops hailed Polish Solidarność, a reactionary movement masquerading as a union that was in the forefront of the drive for capitalist restoration in East Europe. The AFL-CIO channeled millions in CIA money to Solidarność. And the AFL-CIO sponsored a Labor Committee for Free Cuba, a collection of gusano counterrevolutionaries and CIA Cold Warriors who dream of smashing the Cuban Revolution and retaking the island for their imperialist masters. Today, the union tops promote pro-imperialist labor activists like Chinese exile Han Dongfang, who broadcasts on the CIAs Radio Free Asia and is a darling of American right-wing circles. Political struggle against the pro-capitalist program of the labor tops, which ties the working class to its class enemies in the Democratic Party, is central to the fight to forge a revolutionary workers party in this country. Now I want to talk briefly about a couple of so-called socialist groups that claim to stand to the left of the labor bureaucracy. Almost all of them claim that China is a capitalist country. This is not a mistaken analysis. This is an anti-Communist political program. The International Socialist Organization (ISO) claims China has never been a workers state but has been state capitalist since 1949. This absurd theory, which they also apply to the other workers states, is a fig leaf for decades of anti-Communist practice on behalf of imperialism. The ISOs former parent group, the British Socialist Workers Party (SWP), originated when its founder, Tony Cliff, bowed to bourgeois hysteria accompanying the Korean War. In a craven capitulation to the Labour Party government, which had sent troops to Korea, Cliff refused to defend North Korea, China and the Soviet Union against U.S. and British imperialism. Cliff and his followers went on to hail every manner of imperialist-backed movement against the workers states. This included the pro-capitalist rabble in Moscow in August 1991 around Boris Yeltsin, whose triumph paved the way for the destruction of the Soviet Union. The SWP proclaimed, Communism has collapsed.... It is a fact that should have every socialist rejoicing (Socialist Worker [Britain], 31 August 1991). One doesnt even have to be a communist for the callous stupidity and inhumanity of that stance to make your blood boil! The return of capitalist exploitation to Russia produced armies of the unemployed and homeless, plummeting life expectancy, murderous nationalism and the destruction of womens rights. Unfettered by what had been the industrial and military powerhouse of the non-capitalist world, the U.S. has felt free to launch military adventures all over the world, while capitalist governments everywhere have accelerated their attacks on workers and the oppressed. Then there are the Maoists of the Revolutionary Communist Party (RCP). Their draft program speaks of great revolutionary achievements of our class in this past century—especially in the Soviet Union between 1917 and 1956 and then in China, where the proletariat seized and held power between 1949 and 1976 and made great advances on the socialist road. 1956 is when Soviet leader Nikita Khrushchev made a speech exposing Stalins crimes, or some of them. 1976 is when Mao died. A speech, a change of regime—the class nature of the state changes, thank you very much and lets move on. Its absurd. The RCP coyly omits that its slavish following of the Beijing Stalinist regime led it to denounce as social imperialist the Soviet degenerated workers state, which the Maoists claimed turned capitalist in 1956. 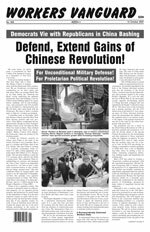 If the working class in the United States, Japan and the other capitalist countries does not come to understand the historic significance of the Chinese Revolution, like the collectivized economy, then it will never understand the importance of making a revolution against its own bourgeoisie. Comrades and friends, it is for the purpose of providing the necessary leadership to the proletariat that the International Communist League seeks to reforge Trotskys Fourth International, world party of socialist revolution.